Michael Jackson continues to be a phenomenon! 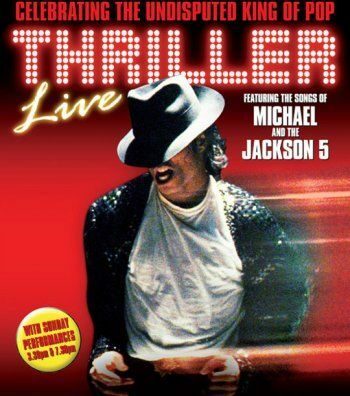 Taking advantage of special offers on Thriller Live Theatre Breaks is your chance to experience the music of the greatest popstar of all time! Thriller Live is the London show rocking London theatre audiences night after night at the Lyric Theatre. It brings to life the distinctive sound of the King of Pop with special multi-media effects. Thriller Live! Theatre Breaks are great value ticket and hotel packages and we have some special deals both for tickets for this tour de force stage extravaganza and for overnight accommodation starting at just £68 per person. All of Michael Jackson’s popular hits are there: I Want You Back, I’ll Be There, Can You Feel It, Blame It On The Boogie, Beat it, Billie Jean and of course Thriller!. And as well as the songs there’s the dancing: a special combination that will get you up and movin’ in this feel-good show. Want to write your own review? Last week I saw thriller the musical - it was amazing! The singing was excellent and the stars of the show were all fantastic. We all had good fun! There are also theatre-only deals available for Thriller – Live tickets.